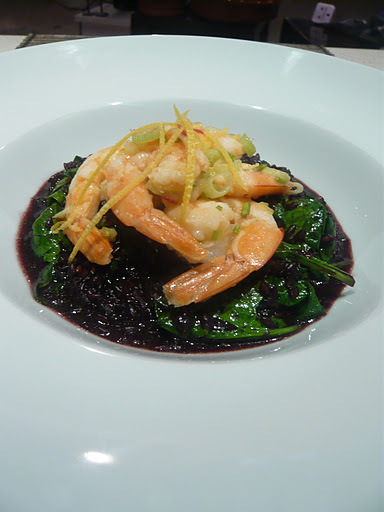 Black rice is quite new to me, but it’s a whole food which means I can use it on retreats. As a result, I have been trying out different recipes and it has really grabbed me. A search on the internet yielded many dessert recipes but few savoury ideas. 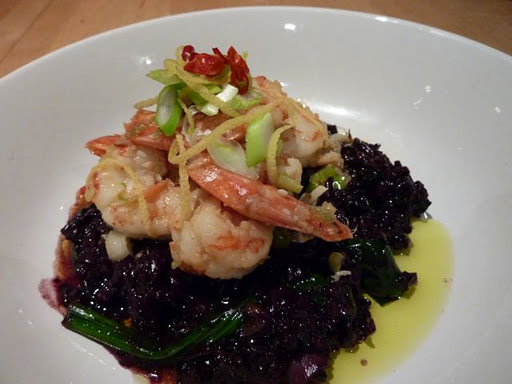 Black rice is packed full of the good stuff (see store-cupboard) and is visually amazing. It is not the same as wild rice. It’s much softer and smoother to eat. The biggest drawback is the cooking time, it’s like brown rice in that it takes 35-40 mins, but it’s worth it for the visual impact and the original velvety taste. Dice the shallots, quite small, and press the garlic. Fry both off in olive oil in a heavy bottom pan. When they are turning brown add the rice and stir in well. Add the stock and once it’s at a rolling boil, turn it down to a simmer. Keep an eye on it and stir gently occasionally. 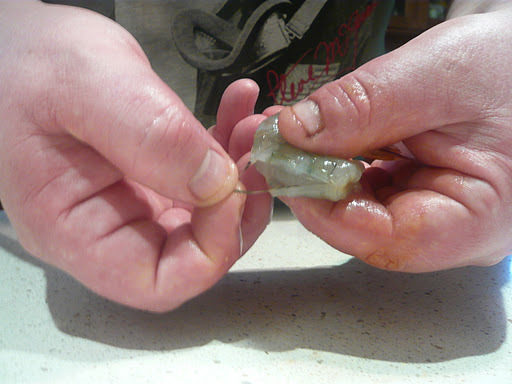 Peel and de-vein the prawns – do this job next to running water, as it can get messy. Zest the lemon, de-seed and finely chop the chilli, and pick the coriander. Heat a saucepan of water. 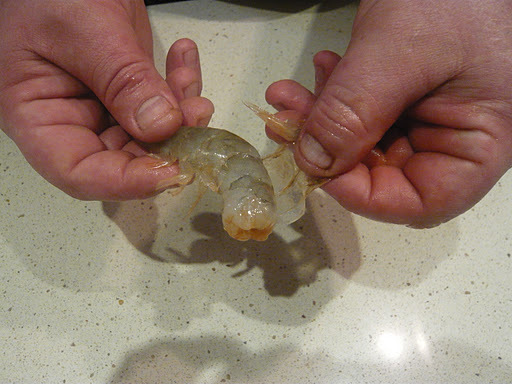 Drop in the prawns and cook with lid on for two minutes. 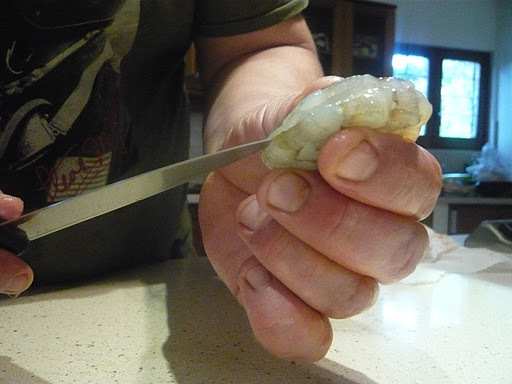 Take a prawn out and cut into one of them to make sure it is cooked (if it’s not give it another 20 seconds). Put the drained prawns in a mixing bowl and add the chili, spring onion and half the lemon zest with a tablespoon of olive oil, the juice of half the lemon and a pinch of sea salt. 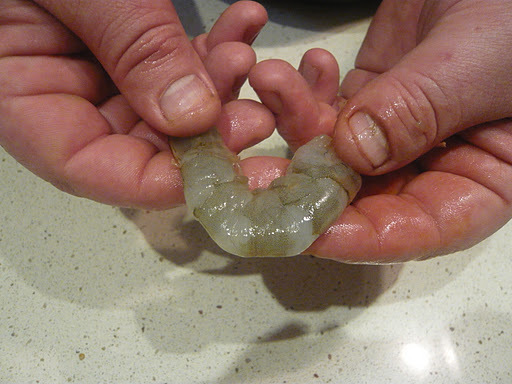 Gently turn the prawns over until it is mixed together. After 30-35 minutes when the rice is cooked turn off the heat and taste for seasoning. Squeeze in the other half of lemon and add the spinach. Put a lid on the pan (keep the heat off) and leave for a minute. Take off the lid and fold the wilted spinach into the rice. To serve lay a spoon full of the rice and spinach into a bowl or on a plate. Place a circle of prawns as in the picture. Garnish with the lemon zest that is left and the coriander.